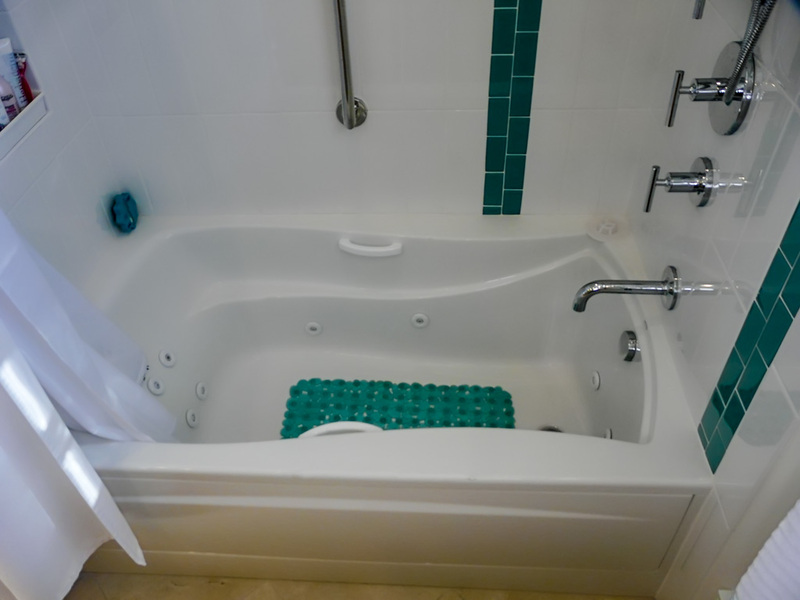 Replaced Tub with New Slightly Larger and Deeper Soaking Tub with Whirlpool Jets and Replaced Tile Tub Surround with Tub to Ceiling Tile in an Older Retro Style, with a Modern Twist in Border Treatments. 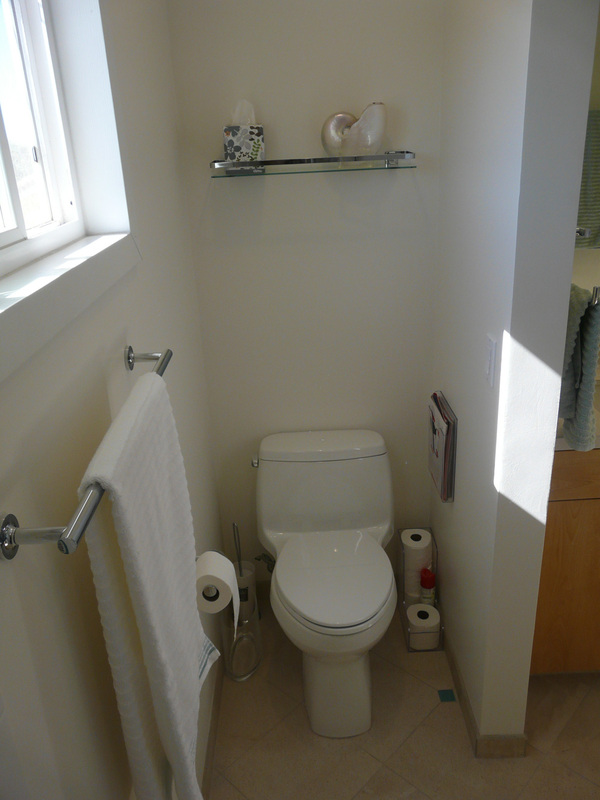 Added Recessed Shampoo Box at Back of Tub Low Enough to Access While Bathing, Yet Still Convenient When Showering. 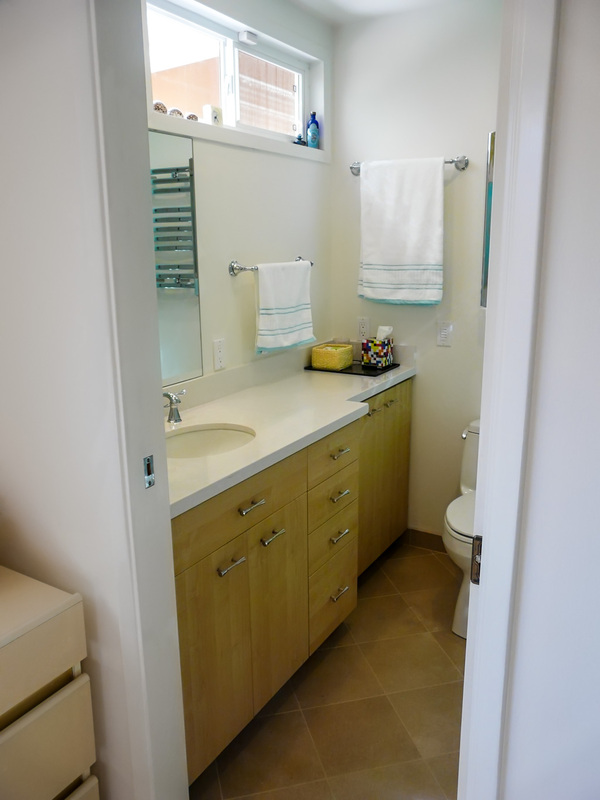 Similar to her kitchen and other bath, primary need was to upgrade the baths to a retro style she liked, while improving storage and overall bath functionality. 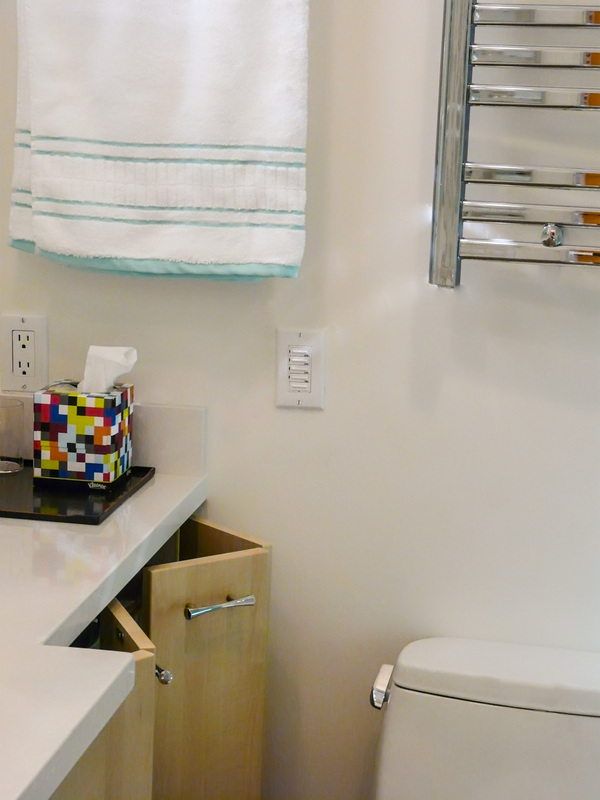 We tried the best we could to conform to my functional bath checklist, with one exception. 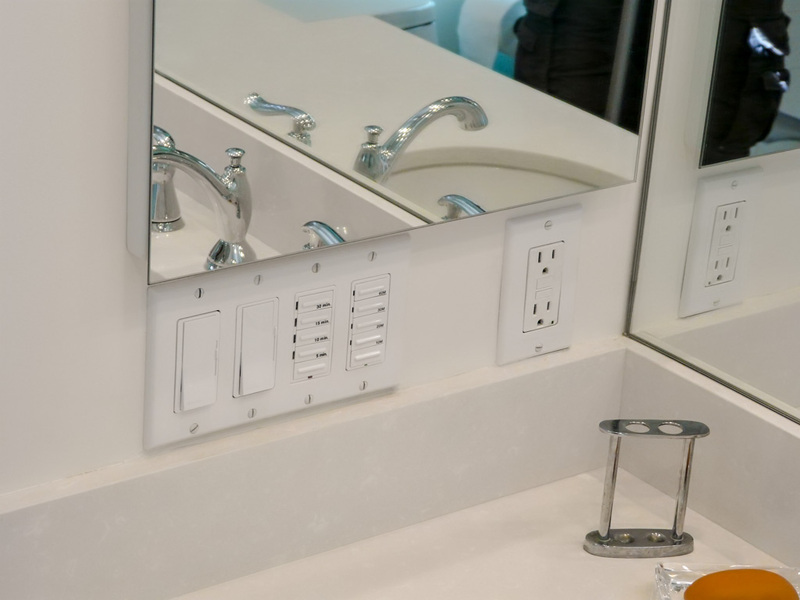 The client chose not to bring the sinks close together and place wall cabinets on either side of them with outlets inside which is a hallmark to most of my functional bath cabinetry. 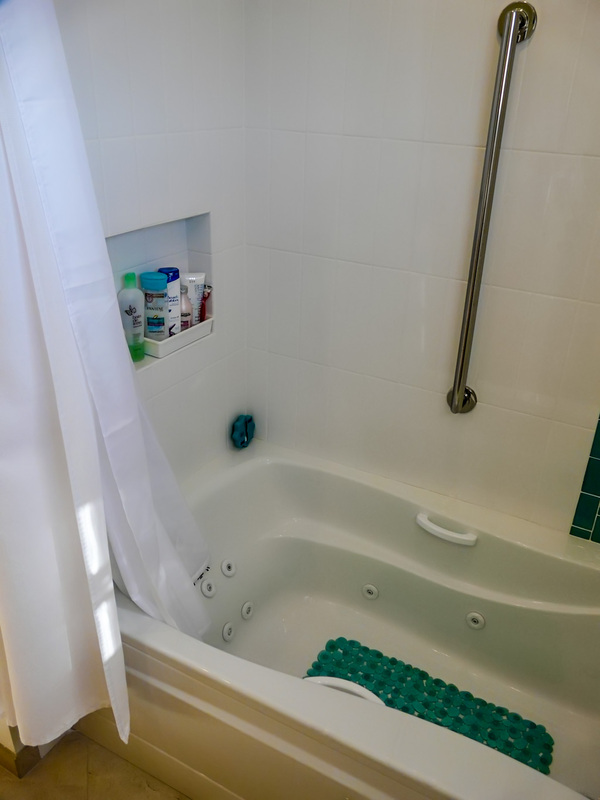 This bath has always been used only by her and she really liked the added feeling of spaciousness she was used to from wall-to-wall mirrors on that large wall above the two sinks. 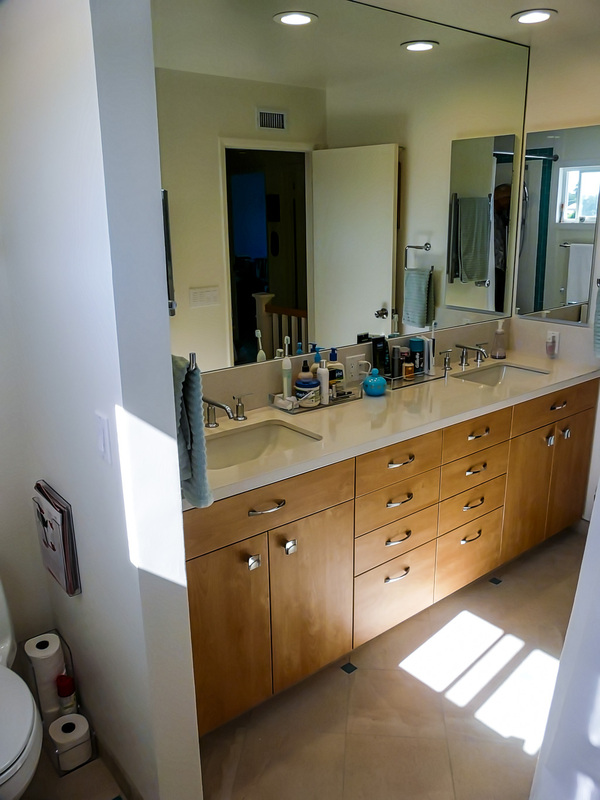 We did add new Zacca medicine cabinets on both ends for extra storage off the countertop, but you can see that I did not clean up the bath prior to pictures. I like leaving all my job photos as close to the clients everyday use for all to see how they use the area and how their choices in style affect the functionality. 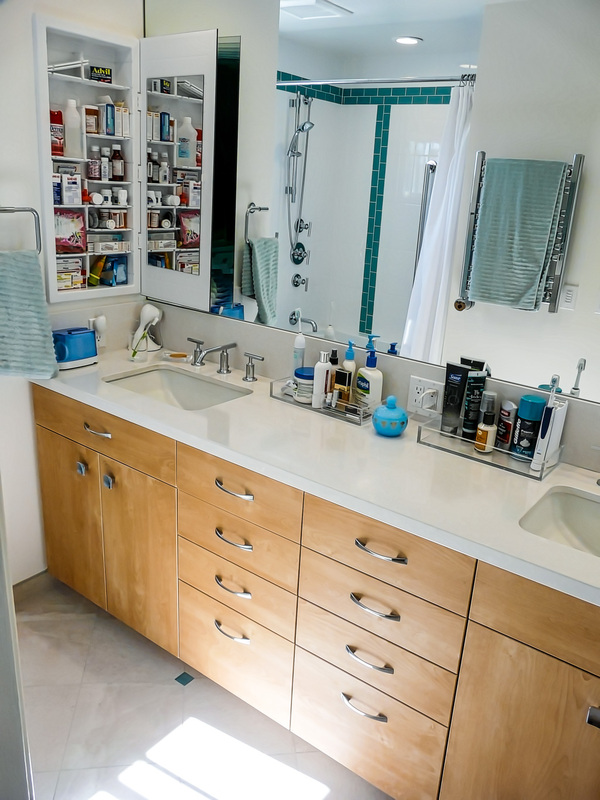 In this case, you see the countertop between the sinks is used as a storage area for all the little items she needs access to two or more times daily. She puts them in plexiglass containers to keep them a little more organized, but they are out in the open not hidden behind doors. 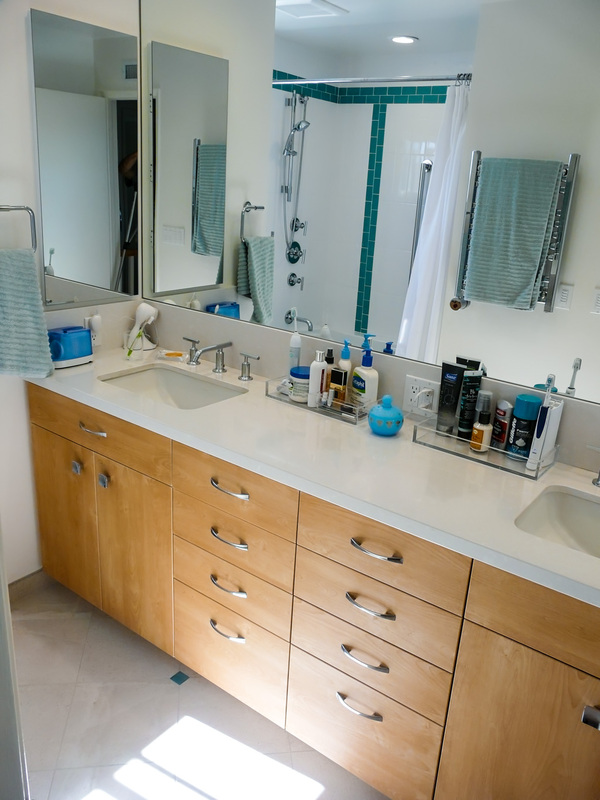 The advantage to my use of the wall cabinets to each side of the sink is to get those items off the counter and out of sight behind doors that are left open during use for easy access and simply closed when you leave the bathroom. Other than that style choice, this bath fits all the other criteria of a functional bath: higher countertops, a recessed shampoo shelf at right height for both tub and shower use, no shower doors (a curtain is used instead so there is easier access to and use of the tub), and good venting and heating on timer switches. A timer switch was also used for the towel warmer the client chose. 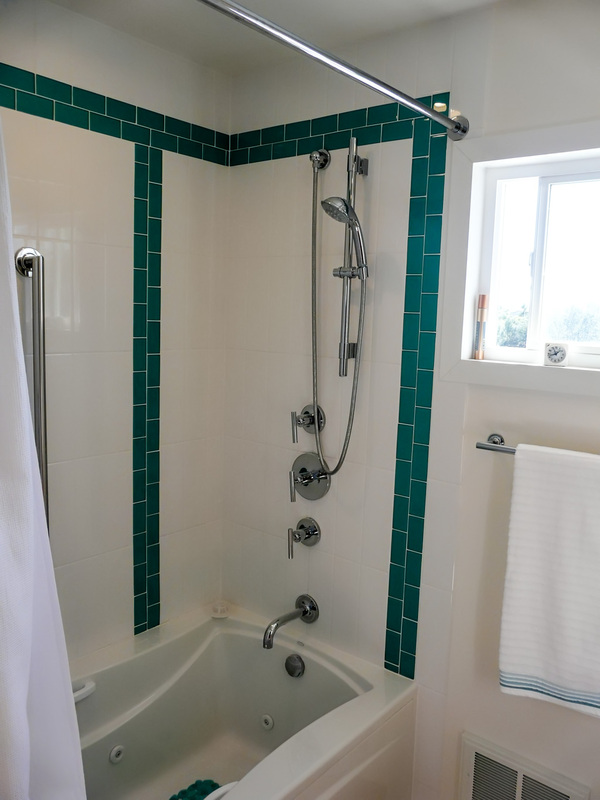 The shower tub was a priority for her, and we ended up getting a larger soaking tub with whirlpool jets and a retro look tile surround with a bit of a modern border pattern. 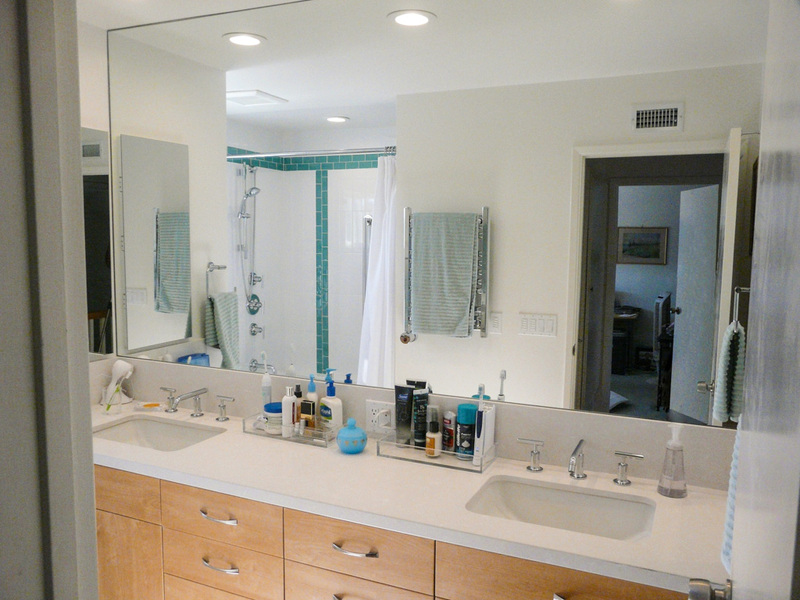 Well placed LED lighting on dimmer switches over the sinks, tub and toilet keep this bath bright both day and night. 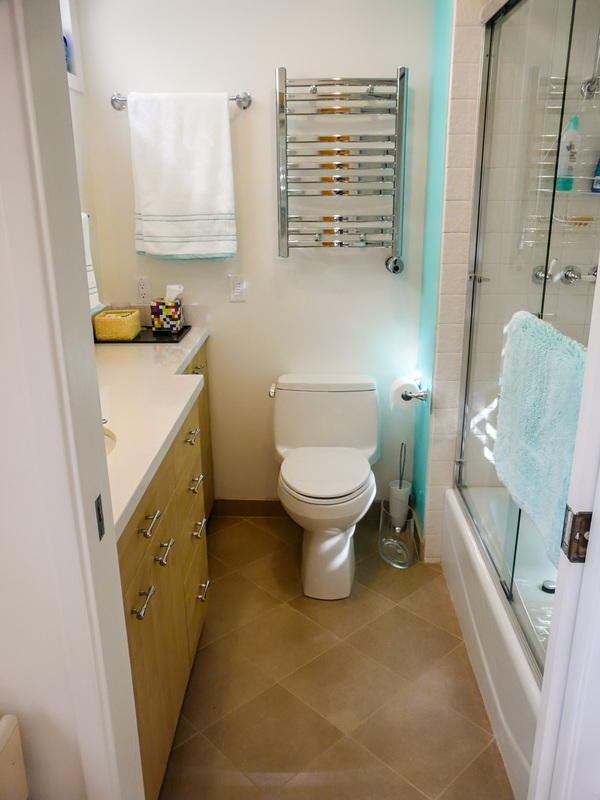 The objective was to upgrade the bath with easier to access storage, better lighting, and update the style. The client chose to use the same material cabinets as she used in her kitchen remodel, European Steamed Beech veneer cabinet doors but a different color stain, with white melamine interiors. 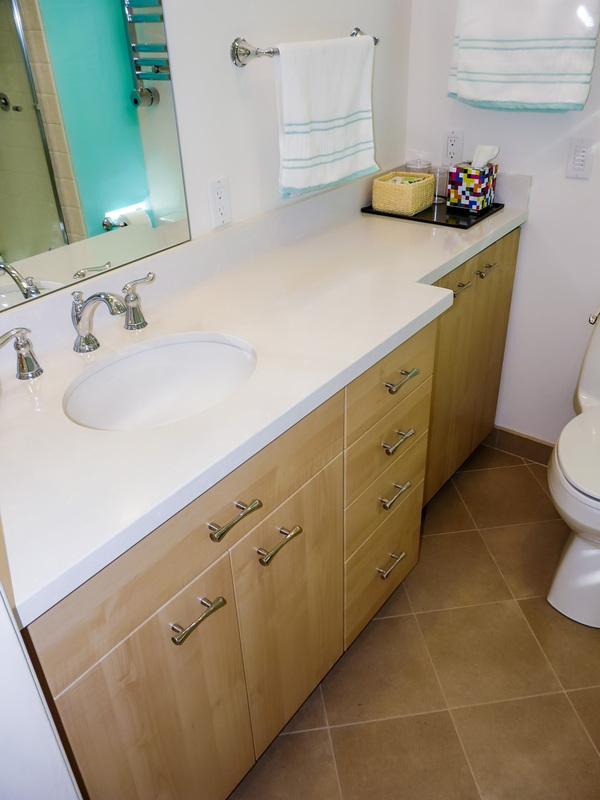 We then added soft close full extension drawers and bifold cabinet doors near toilet for easier access to storage. 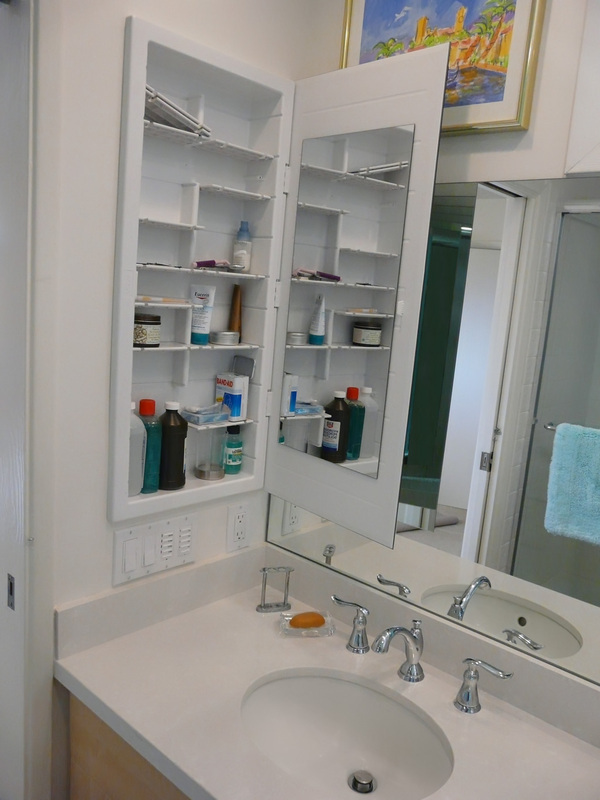 A new Zacca medicine cabinet and larger mirror provided more additional storage and made the room feel larger. 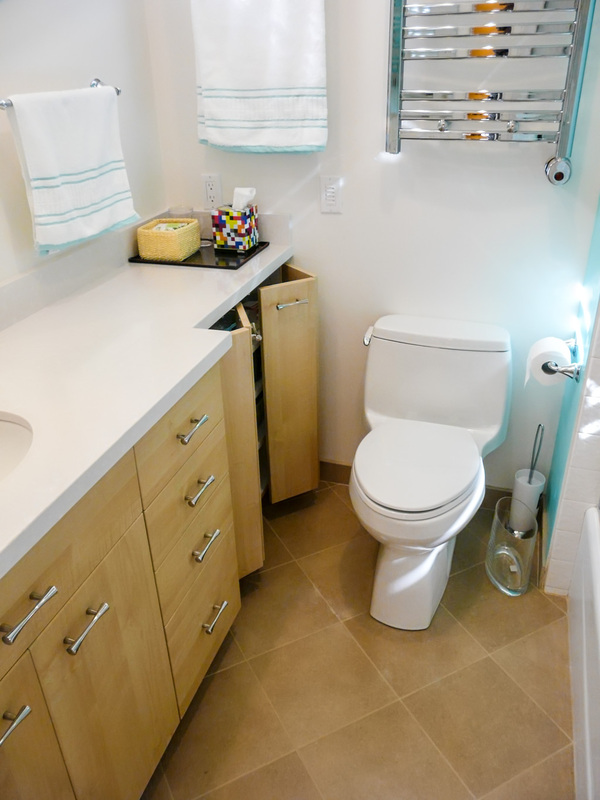 New 12 x 12 porcelain tile flooring set at a diagonal helps the other bath items, toilet, and cabinets stand out a bit more. 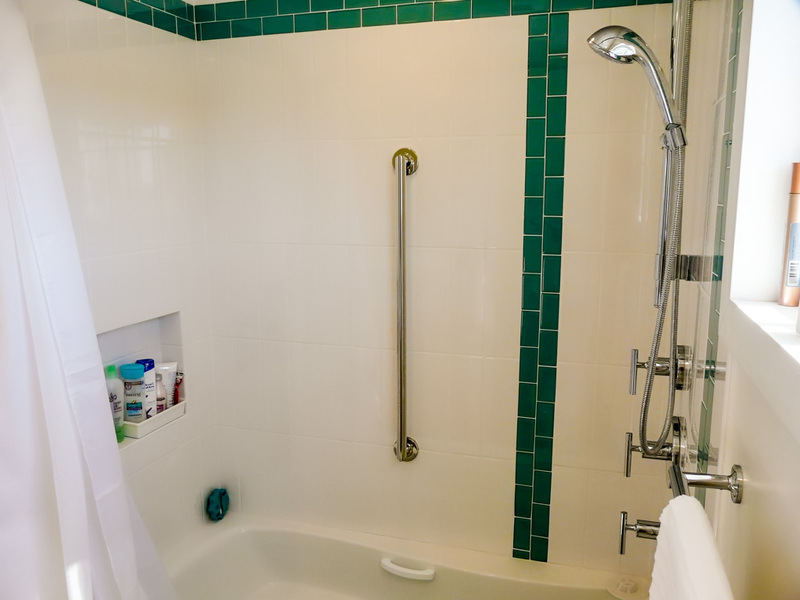 White quartz counter tops were used to pull together the color of the old existing 4 x 4 white tile tub surround, which was not changed. It gave the same retro look the client liked and used in her kitchen counters. 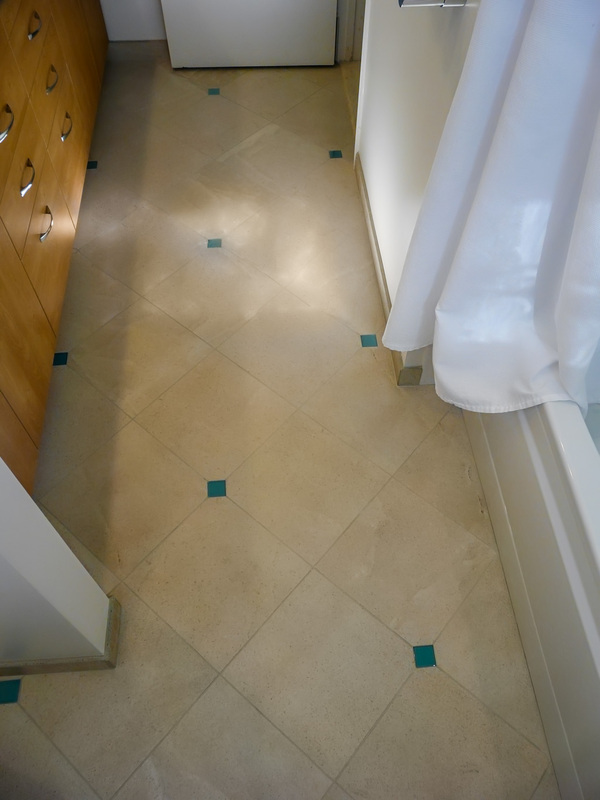 It’s worth noting that this was a 50 year old tile installation that was done properly — it never failed, unlike most of today’s tile work that is lucky if it lasts 10 years! I still do tile work to last by using techniques that have been known for many decades, not the new techniques advertised by the tile trade in an effort to sell more tile to untrained technicians. Venting in this bath meets my “functional bath” venting recommendations. The heater and ventilator are both wired on timer switches. As well as timer switch added to the towel warmer. High quality LED lighting on dimmer switches over the vanity, toilet, and shower make this bath bright and functional day or night.